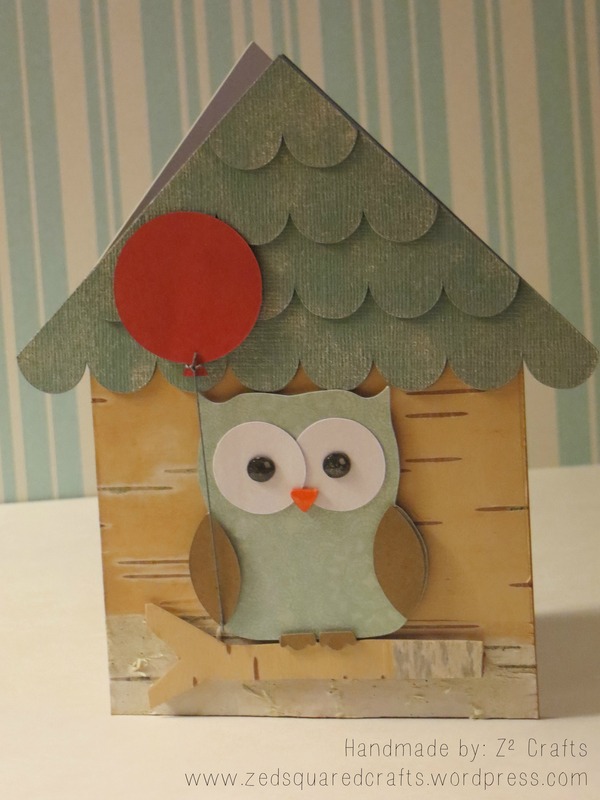 I just finished a birdhouse shaped birthday card for my sister-in-law. I like shaped cards because of the “whimsy” the shape adds. With the help of my Silhouette Portrait machine, making shaped cards is easy, especially since there are a ton of free shapes and clip art available online. Using my Silhouette machine, I cut the birdhouse shape with a free cut file from Birds Cards on 110 lb Neenah Solar White cardstock. I specifically used a heavy cardstock because I didn’t want the heavy front (birch, owl, and shingles) to make the card too flimsy. For the background, I used a piece of birch that I found on a hike. It was easy to cut using my paper trimmer. I cut two of each of the layers of shingles and adhered them together for dimension. I finished the front by sponging the shingles with platinum Memento ink for texture. I cut out the owl’s body from some teal patterned paper (from My Mind’s Eye) and used Glossy Accents on the beak and eyes. I adhered the wings and claws using foam tape. The balloon was left over from another project. I used Simon Says Stamp Lipstick Red ink and a sponge blending tool to colour it red. I’m pleased with how the card turned out. The texture and dimension make the card special enough for a family birthday. To complete the card, I made a custom envelope using craft cardstock and lined it using the same teal patterned paper as the owl.